The downtown OKC Streetcar grand opening is December 14, 2018 - Why are we so excited? Grand opening of the new Streetcar in downtown Oklahoma City is scheduled for December 14, 2018. A large, $136 Million MAPS 3 project is scheduled to open in only a few weeks. This project will open, debt free, thanks to a $.01 sales tax voted for by fellow Oklahomans. The official ribbon cutting will be from 10 am - 11 am on December 14th at the Business District platform. This will be followed by festivities including musical performances by Emily Ellis, Jamie Bramble, Madison McCoy, and Edgar Cruz. The event will also include a magician, Michael King, performing at 4 pm - 5 pm. The event ends with a Light/Night: Streetcar Opening Celebration at OK Contemporary (3000 General Pershing Blvd). 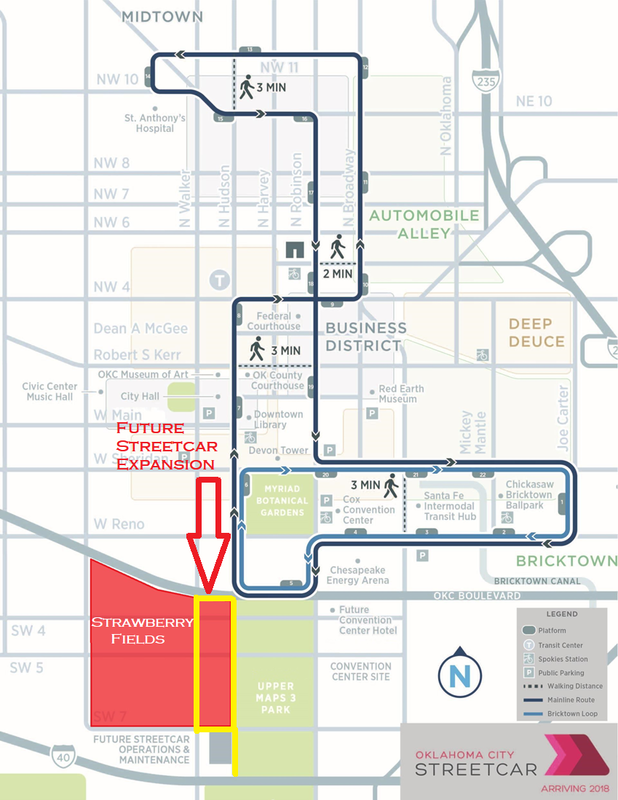 Additional information can be found at the Streetcar website. You can also catch the game downtown when our own OKC Blue NBA team hosts the Memphis Hustle at the Cox Convention center from 7 pm - 10 pm. Would you prefer a Christmas event instead? The Painted Sky Opera is performing Amahl and the Night Visitors at 7pm at the First Baptist Church (1201 N. Robinson Ave). So, why is Strawberry Fields so excited? If you look at the map below, you can see the current route of the Streetcar system. As it stands, it already connects the north east corner of Strawberry Fields to the rest of downtown. The really exciting news is that the future expansion of this new Streetcar system will give access through the development. This will be a fantastic resource for anyone who lives or works in the new Strawberry Fields development. For more information about Strawberry Fields - visit us on Facebook or on our website.